Dr. Van Zee accepts the following list of insurance providers. Select your insurance provider to see more details. I am a surgical oncologist with a practice dedicated exclusively to the treatment of breast cancer. For almost 20 years, I have used my skills to provide the highest quality surgical care to women with breast cancer. I spend two full days in the operating room each week, and I see outpatients in the new Evelyn H. Lauder Breast Center. My research interests include exploring diagnostic and treatment options for patients with ductal carcinoma in situ (DCIS), in which cancer cells are confined within the ducts of the breast and have not invaded into the surrounding breast tissue outside of the ducts. The diagnosis of DCIS has increased exponentially over the past two decades. Yet, the recurrence rates for women with DCIS treated with breast-conserving surgery has not been as low as that of women with the more common invasive breast cancer. In women with DCIS I found that women of younger ages are at higher risk for local recurrence. I also found that the volume of tissue removed from the breast and the number and distance of ducts containing DCIS from the margin of the resected tissue are related to chance of recurrence. I have examined the various factors that influence the risk of local recurrence after breast conserving surgery for DCIS, and created a risk prediction model, called a nomogram, to help clinicians and patients estimate the risk of recurrence. This tool has been validated in at least two different populations to date, and will hopefully help clinicians and women weigh the various treatment options for DCIS. Another area of special interest is sentinel lymph node biopsy. This is a method in which the breast tissue is “mapped” to identify one or a few nodes to which a woman’s breast cancer would first metastasize (spread). I developed a predictive tool called a breast cancer nomogram that calculates the likelihood of additional lymph node metastases in breast-cancer patients who have metastasis in a sentinel node. This helps patients and doctors make decisions about the pros and cons of axillary dissection (standard removal of most or all of the underarm lymph nodes). This nomogram has been widely adopted and validated at dozens of institutions around the world. We also developed a second nomogram to help a woman with breast cancer predict the risk of having sentinel node metastases. This nomogram can help a woman understand her risk after she’s had a breast biopsy but before the results of the sentinel node biopsy are available. My colleagues and I also investigated patients’ quality of life after breast surgery. In a prospective study that we conducted over several years, we compared the frequency of sensory changes and lymphedema (arm swelling) after sentinel node biopsy (removing a selected one or a few lymph nodes) to that of axillary dissection (conventional surgery to remove most or all of the lymph nodes under the arm). 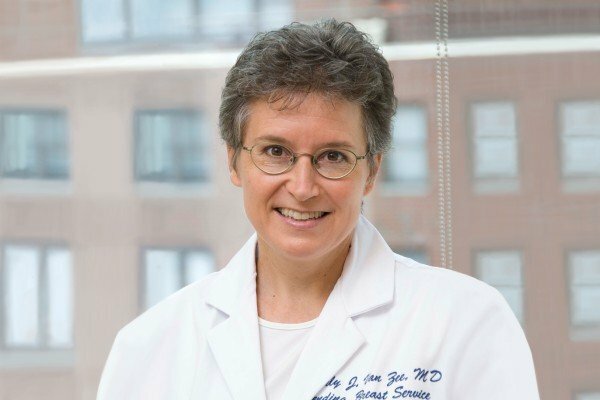 In order to share information that we have learned about breast cancer at Memorial Sloan Kettering, I have lectured extensively, both nationally and internationally, and authored many manuscripts on topics in breast cancer. You can view a listing of my publications in PubMed by clicking on the PubMed icon below. Visit PubMed for a full listing of Dr. Van Zee’s journal articles. Pubmed is an online index of research papers and other articles from the US National Library of Medicine and the National Institutes of Health.